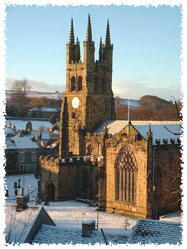 The ancient village of Tideswell is situated in the heart of the Peak District National Park six miles from Bakewell. Located in a large valley it's surrounded by scenic hills and dales crisscrossed with the traditional dry-stone walls long associated with this area of northern England. 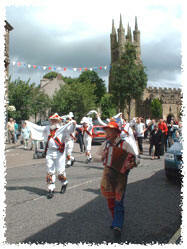 The original settlement of Tideswell predates the Roman occupation and become a thriving market town in the Middle Ages when its magnificent church was constructed. Although not actually a cathedral, St John the Baptist is known locally as the 'Cathedral of the Peaks' due to its impressive architecture that dominates the village. In the 19th century with the growth of the textile industry Tideswell's small factories produced silk scarves and handkerchiefs for the Macclesfield silk industry while nearby mills in Cressbrook and Litton produced cotton. 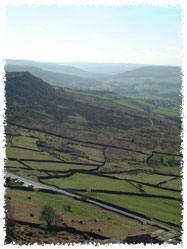 The mills have long since closed but with the establishment of national parks in the 1950s under the 'National Parks and Access to the Countryside Act' along with increased popularity of recreational walking and activity holidays, Tideswell remains a lively place rich in rural heritage. In the Spring and Summer months the Peak District tradition of Well dressing takes place with many towns and villages participating in this very old practice of dressing the village wells and springs to give thanks for the purity of the water. 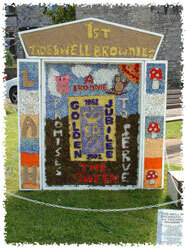 Tideswell's well dressing takes place on the Saturday nearest to the 24th June and kicks off a week of activities including, brass bands and guising (a custom of acting out traditional plays based on local folklore), and culminates in a carnival and torch-led procession through the village on the following Saturday. 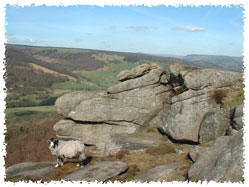 A popular destination for hillwalkers and hikers, Tideswell enables easy access to the Peak District's large network of public footpaths. Several long-distance trails are also available in the park which are popular with cyclist, horse riders as well as walkers. While the many grit-stone outcrops , Peak limestone cliffs, caves and caverns are popular with rock climbers and cavers alike. Water and air sports are also popular with nearby lakes and reservoirs provides opportunity for sailing, fishing and canoeing while gliders, hang-gliders, paragliders, and balloonists are a common sight in the local skies. Whatever you reasons for visiting the Peak District, Tideswell is an ideal base for exploring the National Park along with its charming villages and many local attractions. Click here to enquire about availability of bed and breakfast or holiday apartment accommodation at Rockingham Lodge.